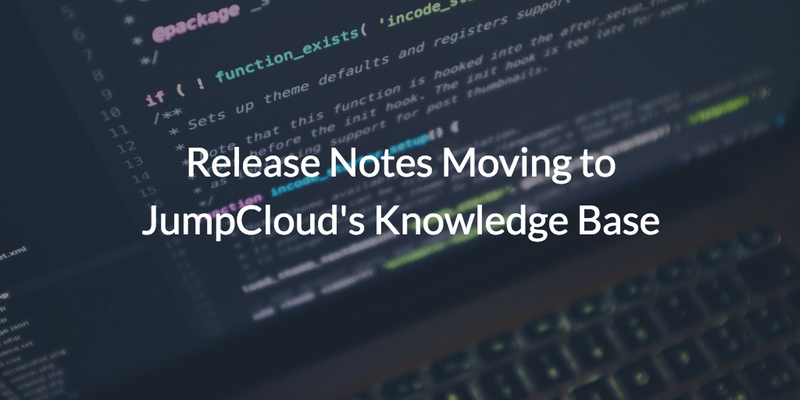 Release Notes Moving to JumpCloud’s Knowledge Base! Home » Blog » Directory-as-a-Service (DaaS) » Release Notes Moving to JumpCloud’s Knowledge Base! We are happy to announce that our Release Notes will be migrating from our Engineering Blog to the JumpCloud Knowledge Base. In this new location, you will still be able to use your preferred RSS reader to keep up-to-date with our latest feature releases. This migration will not only better serve as a more centralized location for our releases, but it will also provide enhanced search functionality to better find what features have been released onto our platform. Visit the new release notes page by clicking here. Once on the page, you can expand a note by clicking on the date of the release. For JumpCloud product update information prior to June 2017, you can still use the engineering blog. For future updates, we’ll see you on the JumpCloud Knowledge Base!